After inflicting on Bangladesh one of their biggest defeats in the first match, a full-strength India will look to repeat the dosage in the second cricket Test, starting at the M.A. Aziz stadium here tomorrow. The Supreme Court today reserved its judgement on the Board of Control for Cricket in India (BCCI) appeal against the Madras High Court order restraining new BCCI President Ranbir Singh Mahendra and his team from taking charge and appointing a former apex court judge as the board’s interim administrator. The long-awaited showdown between two of the world’s best pace attacks did not disappoint spectators here today when first the ball, and then the bat dominated proceedings on the opening day of the Test between Pakistan and Australia. Hosts Tamil Nadu’s reluctance to declare and aim for an outright win resulted in a dull draw in their the Elite B Group Ranji Trophy match against Punjab here today. The four-day fixture ended with Tamil Nadu, which had gained a crucial 26-run first innings lead, getting two points from the encounter. This took its tally to 11 points from four matches, while Punjab remained on top at 16. In five-km walk for men Sandeep and Manjit of Jhajjar won gold and silver medal, by covering the distance in 24:21 seconds and 24:23 seconds respectively. Sandeep of Hisar emerged third by covering the distance in 24:28 seconds. Bengal Mumbai Football Club (BMFC) will take on Mohammedan Sporting while Titanium Club (Kerala) will clash with Tata Football Academy (TFA) in the semifinals of the All-India Lal Bahadur Shastri Memorial Football Tournament here tomorrow. Punjab stole the limelight on the concluding day of the 30th National Sports Festival for Women Group-4, here today. Punjab won the first place in kabaddi and in kho-kho and second place in volleyball. Despite having star players like Prabhjot Singh, Jugraj Singh and Bikramjit Singh in their ranks, Amritsar Hockey Club was edged out by Canadian Club United Brothers 3-0, here today. All three star players were off colour. Sunaina won gold medal in the girls’ section in the 26 to 29 kg weight class in the Patiala district Taekwondo championship which concluded here today. The prizes were distributed by Mr K.K. Sharma, Chairman, Improvement Trust, Patiala. Lakhvir Singh of Khalsa college, Patiala, won the men’s decathlon event in the Punjabi University Inter-College Sports Meet, which concluded here today. The prizes were distributed by former Olympics hurdler Gurbachan Singh Randhawa in the presence of Mr Raj Kumar Singh, Director of the Department of Physical Education and Sports and other university coaches at a function held to mark the occasion at the Raja Bhalindera Singh complex. The Indians are expected to field an unchanged team as coach John Wright has promised that there will be no let-up in the performance that has reversed the team’s performance for good in recent weeks. “We hope to repeat a similar result,” Wright said on the team’s target. Wright overruled captain Sourav Ganguly, who had sought to give an opportunity to other players in the team. “There are a few youngsters in the team, but the players must remember that they represent India and have to win their places,” the New Zealander said. Bangladesh can expect the Indians to turn on the heat from the first ball. India will play for the first time at this port city, where the intense security has been an aberration. While the place itself is relaxing with its sea front and pockets of greenery, the battalion of green-clad armed men escorting the cricketers present a mood of confrontation and anxiety. Both Wright and home coach Dave Whatmore agreed that the pitch was a “good cricket wicket” similar to the one laid out at Dhaka. “There will be rewards for some tough bowling and also the batsmen,” Whatmore said. Surprisingly, Bangladesh might not play fast bowler Mashrafe Mortaza, who rattled the Indian top order in the first Test. Mortaza was coming back from a year-long injury layoff and the team did not want to overburden him, keeping in mind the tough schedule ahead this season, Whatmore said the other day. Although he was included in the squad, Mortaza might be replaced by Nazmul Hossain, a 17-year-old right-arm pacer, of whom Bangladesh had high hopes. Hossain picked four for 40 in a one-day international against New Zealand last month at the same venue. The record books do not hold much hope for Bangladesh. They have suffered defeat in all six matches played at the ground since 2001, three by an innings. As in the first Test, at least one milestone is in store as Zaheer Khan looks for his 100th scalp. The 26-year-old Baroda player cracked the world record individual score for a number 11 batsman with his whirlwind 75 at Dhaka, but would definitely cherish a century of wickets than runs. Irfan Pathan at the other end has completed one year with the Indian team since his debut in the memorable Adelaide Test. And with the two new-ball bowlers firing on full cylinders from both ends, the prospects look bleak for Bangladesh. Ironically, in both Bangladesh innings, the tail wagged long as the Indians allowed the innings to drift. It did not go unnoticed by the coach. “In the first innings, we had them 50 for five, but did not nail them there,” Wright said. “No matter whom you play, you have to be consistent. You have to set your own standards. I feet that it is one area we are not probably good at,” he said. One will also expect Rahul Dravid and V.V.S. Laxman to come up with big knocks. The former had the embarrassment of losing his off stump while shouldering his arms, and the latter once again fell after looking set for a big knock. 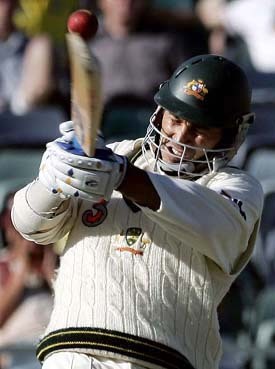 “Laxman played a beautiful little innings. And we all know what Dravid is capable of,” Wright said reinforcing his faith in the batsmen. For Bangladesh, their continued struggle has left cricket fans somewhat desperate. The other day, Whatmore was left pleading “for more patience” with the team, which he believed was making constant improvement. The former Sri Lankan coach said the series defeats would not hamper the team’s morale when they went into the match. “You have got to forget the result and put it behind you. There is no looking back,” he said. 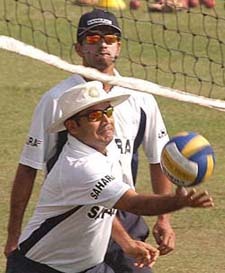 Teams (from): India: Sourav Ganguly (captain), Virender Sehwag, Gautam Gambhir, Rahul Dravid, Sachin Tendulkar, V.V.S. Laxman, Mohammad Kaif, Dinesh Kaarthick (wk), Irfan Pathan, Anil Kumble, Harbhajan Singh, Zaheer Khan, Murali Kartik, Shib Shankar Paul, Gangandeep Singh. A Bench of Mr Justice N. Santosh Heged and Mr Justice S.B. Sinha reserved the verdict after two-day-long arguments by contesting parties, bringing to the fore “uncertainties” about the present status of the BCCI. The uncertainties were aplenty — the BCCI’s admission that outgoing President Jagmohan Dalmiya was in the saddle as the board’s de jure chief not Mahendra, and the old BCCI body having filed the appeal in the apex court, not the new one. When the Bench further asked as to what would be the status if the BCCI appeal was rejected and a fresh election was ordered, Singhvi said the newly elected office-bearers had to be given notices to be heard in that case as there was no petition in the court challenging their election. Singhvi said Dalmiya was ready to quit tomorrow as de jure President if the court passed an order for the conclusion of the annual general meeting (AGM), which had been adjourned without confirming his appointment as Patron-in-Chief and ratifying the election of Mahendra and his team. On the other hand, advocate Harish Salve, appearing for Chennai-based Netaji Cricket Club, which had filed the suit in the high court, sought a fresh election, saying the BCCI as a federal body of cricket associations in the country was expected to hold its elections with a high standard of public acceptability. The manner in which the elections were conducted did not conform to the high standard set and there was a tie among 30 association members for electing the President, said Salve. The election was decided by the casting vote of Dalmiya, who as BCCI President, was the chairman of the AGM of 29 when the elections were held, added Salve. This was strongly contested by Singhvi and Dalmiya’s counsel Sidhartha Shankar Ray, who said there was a clear provision in BCCI rules that the chairman of the AGM had the right of the casting vote, besides the right to vote as a member. At stumps at the WACA ground, Australia were back in control after opener Justin Langer guided his side to 357 for eight, with a gritty and at times, commanding 181 not out. Tailender Michael Kasprowicz was with him at the crease on four not out. It was a remarkable recovery after Pakistan grabbed the contest by the scruff of the neck from the very first ball and refused to let go throughout the morning session, skittling four Australian wickets before lunch and a fifth almost immediately after. Pakistan, firm underdogs before the Test started after losing two of their opening tour matches, hoisted their colours from the outset, selecting four specialist bowlers and an all-rounder. The move paid off when captain Inzamam-ul-Haq won the toss and sent the home team in to bat — giving his lightnings quick pace duo of Shoaib Akhtar and Mohammad Sami the first crack on a green-top wicket renowned for favouring fast bowling. Akhtar did not disappoint, striking the first blow when he trapped opener Matthew Hayden lbw for four with the score at six. It was a far cry from Hayden’s last Test effort at the ground in October 2003 which saw him smash the then world record of 380 runs against Zimbabwe. Fall of wickets: 1-6, 2-56, 3-58, 4-71, 5-78, 6-230, 7-253, 8-333. Hosts Tamil Nadu’s reluctance to declare and aim for an outright win resulted in a dull draw in their the Elite B Group Ranji Trophy match against Punjab here today. The four-day fixture ended with Tamil Nadu, which had gained a crucial 26-run first innings lead, getting two points from the encounter. This took its tally to 11 points from four matches, while Punjab remained on top at 16. Resuming at 190 for three in 76 overs the overnight pair of S. Sharath and S. Badrinath held the innings together for a major part of the day and added 163 runs for the fourth wicket in 398 balls. With two sessions remaining and no declaration in sight despite Tamil Nadu’s overall lead of 300-plus, a dogged Sharath helped himself to a fine century (112, 314 m, 253 bs, 1x4). Badrinath, who was also in good form, fell three runs short of the magical 100 mark. His 97 came in 359 m, 289 b and contained 11 hits to the boundary. Vidyut c Dharmani b Navdeep 99; Ramesh c Ricky b V.R.V. 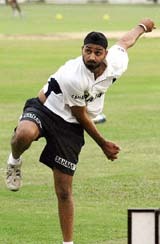 Singh 0; Sriram c Dharmani b Rajesh 15; Badrinath b Sawal 97; Sharath c Dharmani b Sodhi 112; Shri Vasudeva Doss c Sawal b Rajesh 43; Vikram c Dharmani b Navdeep 0; Shrinivas b Navdeep 0; Ramkumar c (sub) b Rajesh 23; Sarathy not out 1; Jesuraj not out 2. Extras: (b-11, lb-1, w-1, nb-3) 16. Total: 408 for nine in 159 overs. Fall of wickets: 1-1, 2-80, 3-147, 4-310, 5-356, 6-357, 7-357, 8-403, 9-404. Joginder Sharma’s match haul of 14 wickets and six for 92 in the second innings for Haryana laid Vidarbha by 41runs in the Plate ‘B’ Ranjit Trophy match on the fourth and final day at the Vidarbha Cricket Association Ground here today. Chasing a victory target of 328 the hosts who began at overnight 160 for three wickets, were bundled out for 286, 56 minutes after lunch, thanks to a lethal bowling performance by Sharma and Sachin Rana. Vidarbha opener Faiz Fazal (81) fell with the addition of only four runs this morning to Rana as the visitors gained control of the match. Except Harshal Shittot (53) no other Vidarbha player was able to offer any meaningful resistance. Tail-ender baburao Yadav (33) used the long handle to some purpose but fell short of the required target of 328. Haryana are now the table leaders with 13 points, while Vidarbha have only eight points from four matches, Vidarbha take on Services at New Delhi next week. Vidarbha (Ist innings): 57 all out; Haryana (2nd innings): 230; Vidarbha (2nd innings): 286 all out (F Fazal 81, H Shittot 53, A Deshpande 35, B Yadav 33; Joginder Sharma 6 for 92, S Rana 3 for 43). Hosts Delhi fell three wickets short of a win and had to be content with two points — thanks to their first innings lead — in the drawn Ranji Trophy Elite Group A match against Karnataka at the Jamia Millia Cricket Ground here today. After declaring their first innings at 427 for seven, Delhi bowled out Karnataka for 292 to take a 135-run lead and scored 115 for one before declaring their second innings, —thus setting up a victory target of 251 for the visitors. Karnataka could score 185 runs losing seven wickets in their second essay. Hosts Hyderabad pulled off a spectacular 22-run win against Uttar Pradesh on the final day of a Ranji Trophy Elite ‘B’ match here today. Medium pacer N.P. Singh came up with a match winning performance claiming five wickets for 51 runs to give Hyderabad skipper Venkatapati Raju, who announced his retirement from first class cricket yesterday, a memorable victory. In 400 m race for men, Ravinder and Sushil of Sonipat won gold and silver by covering the distance in 53:06 seconds and 54:41 seconds, respectively. Third prize was awarded to Pramod of Jhajjar who covered the distance in 54:03. In 100 metres for members of Block Samitis- Nand Kishore of Faridabad won gold and Raj Singh of Hisar was awarded silver. In 100 metres for women, Poonam of Panchkula was first, Namita of Mahindergarh second and Sushila of Hisar third. In volleyball for women, Bhiwani defeated Kurukshetra in the semifinal. In men’s section, Karnal defeated Bhiwani in quarterfinal. In women wrestling in 54 kg weight category, Monika of Sonipat defeated Tripta of Panipat on points. Monika stood third. In 63 kg weight category, Kamlesh of Panipat and in over 63 kg weight category, Anuradha of Sonipat ranked third. In wrestling for men (58 kg weight category), Vijay of Bhiwani defeated Vivek of Karnal whereas Parveen of Sonipat defeated Sunil of Jhajjar. In 67-kg weight category Jasbir of Karnal defeated Sandeep of Hisar and Naresh of Jhajjar defeated Vinod of Panipat. In the concluding league matches, TFA defeated Jammu and Kashmir Bank 2-0 while Mohammedan Sporting defeated Titanium Club by a solitary goal. Ari Benjamin scored the match-winner in the 11th minute of the first half. Titanium Club and Mohammedan sporting finished on six points each, but the Kerala team topped the group by virtue of a superior goal difference. In the other group, BMFC topped the group while TFA finished second. The TFA, after being held goalless in the first half by the bank men, forged ahead two minutes into the second half through Robert Lathalmuna while Bimal Pariya consolidated the lead a few minutes later. 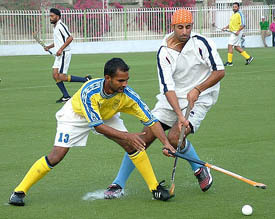 Punjab defeated West Bengal 14-7 in the kho-kho final. Karnataka were third while the fourth place went to Maharashtra. Punjab retained the kabaddi title, defeating Maharashtra 47-28. The third place went to Andhra Pradesh and the fourth place to Karnataka. The volleyball title went to Uttar Pradesh, who defeated Punjab 22-25, 25-12, 25-16, 25-21. Tamil Nadu and West Bengal were third and fourth, respectively. Despite having star players like Prabhjot Singh, Jugraj Singh and Bikramjit Singh in their ranks, Amritsar Hockey Club was edged out by Canadian Club United Brothers 3-0, here today. All three star players were off colour. The local team received seven penalty corners, but were unable to convert any. The visitors were on the offensive from the word go and maintained supremacy throughout. Sunaina won gold medal in the girls’ section in the 26 to 29 kg weight class in the Patiala district Taekwondo championship which concluded here today. The prizes were distributed by Mr K.K. Sharma, Chairman, Improvement Trust, Patiala. The one-day meet was organised by taekwondo coach Pawan Kumar Singla with the Patiala District Taekwondo Association (PDTA). Results: (Girls) 26 -29 kg: Sunaina -1, Harpreet Kaur-2, Isha-3. 35-38 kg: Aarti -1, Neha-2, Vishita-3. 38-41 kg: Gurpreet Kaur-1, Shivani-2, Nikita-3. Boys: 25-27 kg: Chandan Bedi-1, Vikram Kumar-2, Amandeep-3. 27-29 kg: Satinder-1, Atul-2, Tarun-3 . 29-32 kg: Manjinder Singh-1, Tinu-2, Vijay-3. 41-44 kg: Jasveer Singh-1, Rohit-2, Aatish-3. 48-51 kg: Robin-1, Om Parkash-2, Iqbal-3. 51-55 kg: Shiv Karan-1, Amarinder-2, Karanveer-3. Results: Decathlon: Lakhvir Singh (Khalsa College, Patiala)-1, Akash Kumar s (Government College of Physical Education (GCPE), Patiala)-2, Deepak Rana (GCPE, Patiala)-3. 200m (women): Rattandeep Kaur (Shahid Udham Singh (SUS) College, Sunam)-1, Amandeep Kaur (GCPE, Patiala)-2, Baljinder Kaur (GCPE, Patiala)-3. 100m (women): Ramadeep Kaur (GCG, Patiala)-1, Sukhjinder Kaur (University campus)-2, Manjeet Kaur (Akal Degree College, Mastuana)-3. 1500m (men): Pardeep Kumar (Guru Teg Bahadur college, Bhawanigarh)-1, Sukhpal Singh (ADC, Mastuana)-2, Gurbinder Singh (National college, Bhikhi)-3. 400m (women): Rattandeep Kaur (SUS College, Sunam)- 1, Sukhjeet Kaur (GCG, Patiala)-2, Ramanjeet Kaur (Physical College of Education, Bhagomajra)-3. 400m relay (women): GCPE, Patiala-1, SUS college, Sunam-2, GCG, Patiala-3.